This afternoon I decided to set myself a single use plastic challenge in advance of my annual sign up to the Marine Conservation Society #GoPlasticFree July campaign. Having been actively working at being “single use plastic free” for the last 12 months, I was quite pleased (when I gathered everything up to photograph as above) to see just how far I had progressed. • Never use straws – always refuse them! In addition to this I’ve also made some really important lifestyle changes including using washable cloths instead of wet wipes/cleaning wipes – it’s a big problem people using wet wipes and especially if they are flushed – in the words of the Marine Conservation Society the “loo should only be used for the 3 P’s – Pee, Poo and Paper!” – and that’s a very real message from them! I also only buy loose fruit and veg now which in the first instance was a challenge but it’s definitely getting easier – it’s just a discipline really and knowing where to look for supplies -local fruit and veg/farm shops and allotments/veggie boxes are also a good option. I have also been known to unpack fruit and veg and leave the packaging for the shops to dispose of – only on rare occasions though. 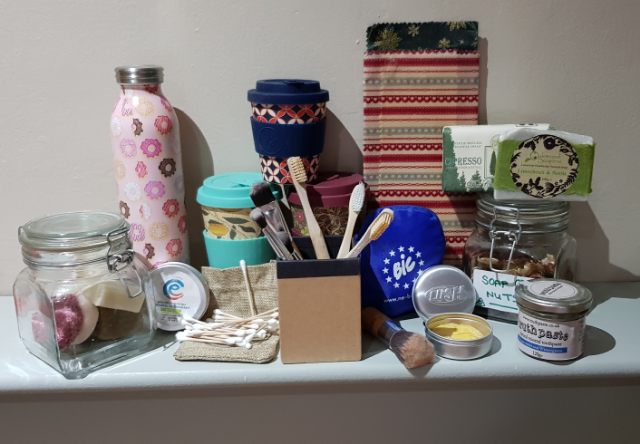 I’ve been asking myself what’s next for my own personal Go Plastic Free July challenge – what’s left that I need to tackle? The answer is – packaging from the frozen food sector! I’ve was quite shocked recently to learn when checking some well-known packets of frozen food that one of them didn’t have any information as to whether it could be recycled – nothing at all on the packaging!. The other merely said “Recycle with Carrier Bags at Larger Stores – not at Kerbside”. I think my #GoPlasticFree July will be spent writing to major frozen food producers/suppliers to ask what their future plans are to eliminate single use packaging and also trying to avoid those who currently don’t offer any packaging recycling options – quite a challenge indeed but given they should be aware of their Packaging Waste/Producer Responsibility I will be interested to find out their responses. So, in advance of the Marine Conservation Society’s July campaign to #GoPlasticFree – who else is up for the challenge? Please do let me know if you are able to join in and it would be great to see your photographs and hear about your own single use plastic free journey!